RSMSSB Livestock Assistant Admit Card 2019. Apply for 1585 posts Rajasthan Pashudhan Sahayak Hall Ticket Exam Date at rsmssb.rajasthan.gov.in. check syllabus, eligibility, how to apply, education qualification required, posts availability, application fees, application process and last date for application. 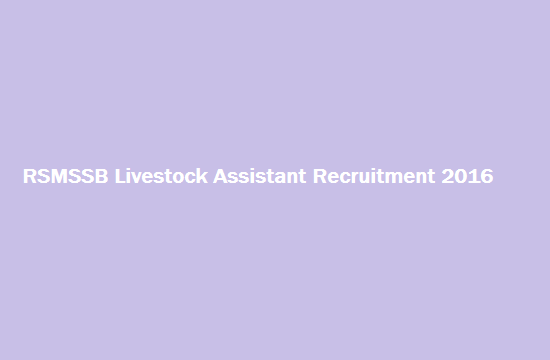 Rajasthan Subordinate & Ministerial Services Selection Board (rsmssb) released huge recruitment notification for live stock assistant on 1st July 2019. candidates who wish to apply for rsmssb livestock asst. notification need to fulfill various criterion. therefore candidates must apply for this post before last date of application. there are 1585 positions of pashudhan sahavak released by rajasthan government according to Advertisement No.02/2019. Well we have assumed till now thousands have already applied. RSMSSB Livestock Assistant Admit Card Exam Date Released for examination going to take place in year 2019. In exercise of the powers conferred by the proviso to Article 309 of the Constitution of India, the State Government has established the Rajasthan Subordinate & Ministerial Services Selection Board (RSMSSB) vide notification No.F.8(7)DOP/A-II/2008 dated 29.01.2014.The role of the Board is essentially that of making recommendations of candidates for direct recruitment in respect of posts carrying grade pay Rs 3600/- and less than Rs. 3600/-. Organization Name: Rajasthan Subordinate & Ministerial Services Selection Board (rsmssb). No. of Vacancies: 1585 vacant positions. Job Category: state government Job (rajasthan). Name of the posts: Livestock assistant / pashudhan sahayak. Commencement of on-line registration of application : 01 July 2019. Closure of registration of application: 31 July 2019. Last date for printing your application : 30 July 2019. Closure for online fee payment : 31 July 2019. Closure for fee payment at kiosk: 31 July 2019. Application Fees: The application fee for General candidates applying for RSMSSB Livestock Assistant Exam Date 2019 need to pay Rs.650/-, Rs. 350/- for OBC/SBC Candidates, for Reserved Category (SC/ ST) candidates the application fee is Rs.350/-. Application fees should be paid through any E-Mitra Kiosk Center (C.S.C) of the Rajasthan State. Starting Date for Submission of Online Application Form: 1st July 2019. Last Date for Submission of Online Application Form: 31st July 2019. Age Limit: The minimum age of the candidate applying for Rajasthan Pashudhan Sahayak Recruitment 2019 should be 18 years and the maximum age of the candidate should be 35 years as on 01.07.2019.Maximum age relaxation of 5 years for SC/ST candidate and 3 years for OBC candidate. (Every candidate which for age relaxation of livestock assistant post must submit valid proof of reservation and age limit). 1 Full Advt. for Livestock Assistant. Click here. 2 Short Advt. for Livestock Assistant. Click here. 3 Syllabus for Livestock Assistant Exam. Click here. 4 How to Apply For Pashudhan Sahayak. Click here. 5 General Instructions to Fill RSMSSB Recruitment 2019. Click here. The online application process has been started from 01-July-2019 on rsmssb.rajasthan.gov.in Admit Card. candidates who feel interested and wants to apply then please hurry up and apply before the last date of submission of application forms that is 31st July 2019. everyone must see educational qualification required, age limit etc. basically complete eligibility process before applying for posts. otherwise if someone who is not eligible for this post he or she shall not be allowed to sit in exam hall and their fees for examination will not be refunded. therefore aspirants who are willing to apply must see complete process for applying for Rajasthan Livestock Assistant Admit Card 2019 Exam Date. Basic pay scale of Rajasthan Livestock assistant Exam Date is starting at Rs.5200 – Rs.20200/- addition to Rs.2400/- grade pay per month. Well, this will only be available for selected candidates who tend to clear complete examination and other selection process. Rajasthan government released various posts according to different categories. all these categories such as gen, schedule caste, schedule tribe, other backward class, sahariya vacancies for pashudhan sahayak Admit Card 2019 are given below in table. Rajasthan Pashudhan sahayak Recruitment Educational Qualification : Aspirant who tend to apply for RSMSSB Livestock Assistant Admit Card 2019 Exam Date must have completed Senior Secondary 12th standard including subjects like Physics, Chemistry & Biology, or Horticulture (Agriculture), Animal Husbandry & Biology from the board of Secondary Education Rajasthan or equivalent. In addition to this applicant should have one year/ two year training of livestock Assistant from a recognized institution by government of Rajasthan. Candidate applying for rsmssb recruitment 2019 must have knowledge of Hindi written in Devnagri Script and any one of the Rajasthani dialects. therefore who so ever fits for this job needs to complete all these process before proceding further. rajasthan subordinate livestock asst. syllabus for examination which is going take place next month or maybe next to next month. candidates must read according to it. prepare your heart and soul into it so that you could clear the cut off examination. soon the organisation will released rsmssb admit card and will will show you on this website only. 1. Objective Type. Part – A. General Knowledge. 40 Marks. 2 Hours. 2. Part – B. Veterinary Science. 80 Marks.